Originally, the floor sections were bathed in black carpet which after 4 decades enjoyed its own eco-system, rotting away happily and the smell wasn’t too friendly either. An early decision was to remove the offending covering and paint the floor panels black but prior to securing into place insert aluminium chequer plate, then screw all parties to the frame. With one large cardboard box, two grown adults would spend an hour bickering about how to make a pair of ‘templates’ from which the alloy will be cut. One error made by yours truly was to buy a 6ft x 3ft sheet of 2mm thick chequer plate which wasn’t easy to either cut or install on an uneven surface; never mind, worry about that later, the first task was cutting cardboard. Once fitted we stood back and admired our handy work before utilising out templates to mark out the shape. We fitted aluminium cutting discs to the angle grinder, these offer a thin cut without melting the metal and created two new floor sections. Obviously, they failed to fit first time but after an hour of adjustment we had a waterproof and study platform installed. Once the front floor panels were screwed down I decided on 1.2 alloy sheet for the rear compartment; these were originally designed as seating but would unlikely to be legal 40 years on, originally just moulded GRP with carpet covering. The Sienna is really a micro-sports car and under the bonnet the small four-cylinder Reliant engine fills the space with the battery (lawn mower size) restricting access enough to require its relocation. The boot area is accessible from the rear panel thus was chosen and rather than drill holes in the flooring we came up with a novel solution. Using marine battery cables we chose to run the wiring through the car via a cut-off switch mounted on the windscreen panel; as with all of the modifications we install, returning the car to its original spec is just a case of removal. 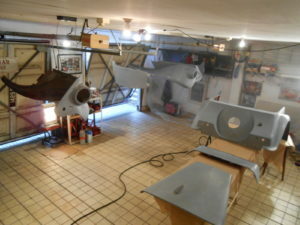 Another decision taken is to remove the soft top mechanism with windows and screen panel and replace with leatherette trimming akin to Jaguars XK120 roadster plus a pair of Brooklands Aero-screens; once again returning the Sienna to its factory finish would be a straightforward replacement. 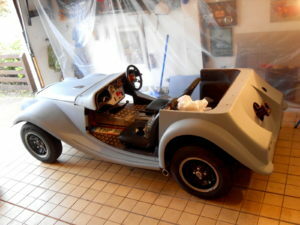 All of that is for the future but for now replacing the extremely heavy scaffold pole bumpers with something ‘in period’ but lighter was the challenge and a British Leyland enthusiast offered a solution. A pair of tired bumpers from a very 70’s Allegro changed hands and once cut to shape these would face the blaster for de-chroming and several coats of gloss black then lacquer. Whilst we are playing ‘name that part’ our friend ‘Spraying Bob’ came up with a lovely flip top petrol filler cap, from where he can’t remember but it is certainly 1960s (turned out to be a TR5a) and will look great once we have modified the pipe to fit. Where the fuel pipe exits the body a rubber trim will be needed for a snug fit and a tidy appearance; what I really wanted was a huge 7cm grommet that could locate into the 3mm panel. The internet came up with Grommets Ltd in Henfield, one phone call and £4.00 plus postage, the perfect fitting rubber solution arrived in the post two days later. No doubt the Sienna was designed to accommodate a pilot enjoying a slight physique and whilst I will confess to have added a few pounds over the years, I am no Tinkerbelle either. Even with size tens wrapped in size eight trainers pressing the gas pedal along with the brakes was an issue we needed to resolve. The foot well is so narrow it needed widening, this allowed for the required pedal separation and this is where GRP panels offer a real bonus. 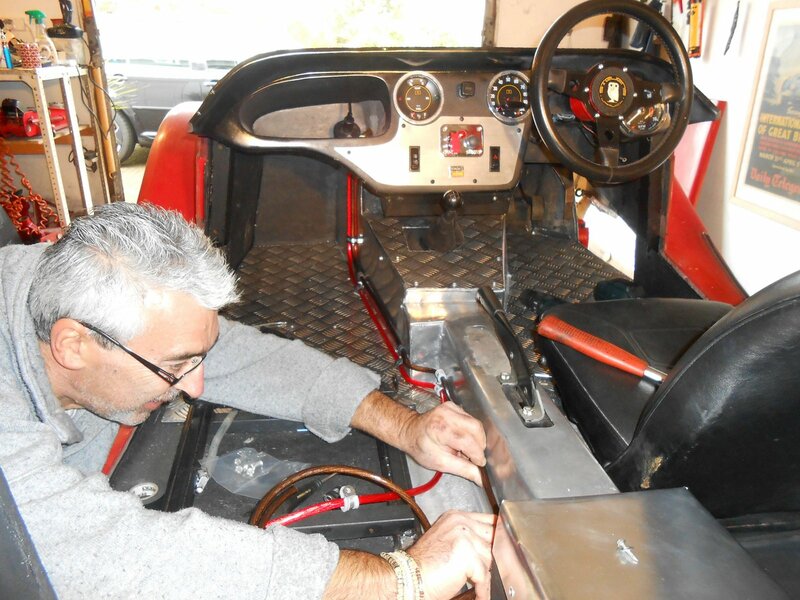 By removing an area of the original inner panel we gained about six inches of ‘foot room’ thus adjustment of the pedal gap was straightforward but the gas pedal base now caught the bodywork in operation. The solution involved a large sheet of rather thick aluminium, one days fiddling and a pack of rivets. The result means an emergency stop won’t result in our rushing towards an accident; we hope.